Going pro usually doesn’t involve scouring Craigslist, but when Peter Olivier read Bill Caswell’s tale of racing a $500 Craigslist beater against professional rally teams, he figured he could do the same on two wheels. Olivier’s $1,600 Craigslist bike held up through all six Pro Supermoto races in 2016, putting him on television and even on the same track as Ken Block. Supermoto takes place on mixed surfaces, with courses that include dirt sections with sweet jumps like you would find on a motocross or supercross track with faster asphalt sections. The bike has to be a wonder-machine that does everything and the rider has to be somewhat of a jack of all trades as well. 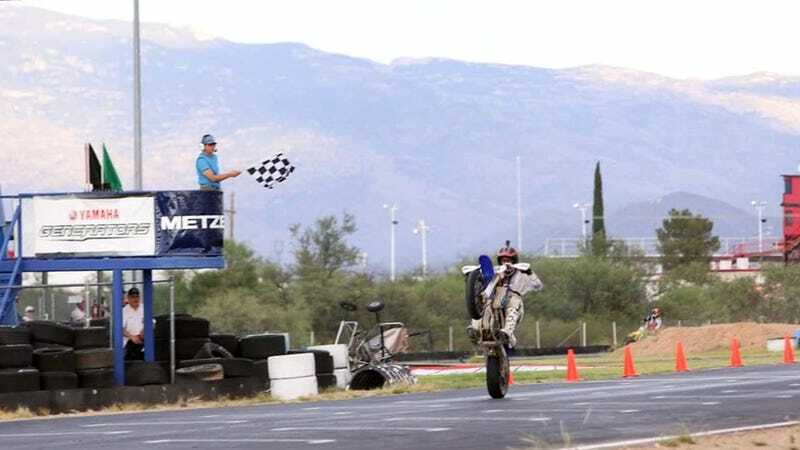 Olivier had been racing supermoto for a few years when the American Motorcyclist Association revived the Pro Supermoto national championship in 2016. It was big in the early 2000s and Olivier dreamed of doing it then, but the championship came to a halt with the recession. With no kids, no girlfriend, a flexible job and no worries, Olivier figured 2016 may be his only opportunity to run off and do something crazy. So, he bought a ten-year-old $1,600 supermoto bike off of Craigslist—successfully talked down from an $1,800 asking price—and entered the 2016 AMA Supermoto Pro Lites Championship. New bikes for the series cost around $7,000, and most had built engines and new suspension on top of that. Getting licensed as a pro for the series was relatively easy. You had to have an AMA membership, and then AMA looks at each Pro Supermoto application for a license individually. With several other friends who entered the championship as privateers, Olivier traveled over 20,000 miles, all on a shoestring budget. Pro Supermoto races were relatively cheap to enter, with entry fees only costing $150. With only six races, Olivier said that he only bought one extra set of tires all season—just in case of rain. Even building the bike itself was relatively inexpensive. While the $1,600 Craigslist special’s 250 cc engine blew almost immediately after buying it, Olivier said it only cost him $1,000 to have a friend rebuild that engine. Olivier spent some money on the suspension, but sourced a lot of parts from his street bike. The brake calipers and clamps were left stock, and he ran no slipper clutch to reduce wheel hop. He sourced a used fuel tank that was a little larger than the stock one and used an adapter bracket to fit larger brake rotors. Factory Connection revalved his suspension, but it wasn’t any kind of new, slick set-up. Building for reliability was key to making every race on the schedule without any major unforeseen costs that could derail the season. So, instead of a high-strung race build, he kept the bike mostly stock, save for a few suspension tweaks. What was an unavoidable expense was getting to races, so he tried to split travel expenses with others whenever possible. Gas money was his biggest expense for the whole season. Trailer in tow, Olivier and friend Rob Wiggins made it to the whole six-race season. Other friends joined in soon, folling Olivier and Wiggins’ lead. His crew soon earned the nickname “The East Coast Grid Fillers,” as they all knew they weren’t going to be the most competitive, and were there to have fun above all else. Long drives between races were tiring, but the camaraderie was fantastic. The group routinely stuck together after a race to party in the pits. Despite being outclassed by the brand new bikes he competed against, Olivier still finished eighth in the AMA Supermoto Pro Lites championship. It was a position Peter got through consistent finishes, with not a single DNF for any of the six races. That wasn’t to say it wasn’t hard, though. Olivier soon learned the biggest issue with taking a Craigslist bike to a pro race: all of the newer bikes completely smoked him on the straights. He estimated that his engine was good for about 30 HP, while new, built 250 cc engines in his class were pumping out 42 or 43 HP. Other issues were somewhat of Olivier’s own doing. He misjudged a colossal 80-foot jump in practice in California and hurt his hand before the first race of the season. Olivier wasn’t about to go all the way out to California and not race, so he raced with his hand in a brace, still red and swollen. It was a mistake Olivier blamed on lack of experience, but he finished the race anyway. A later mishap occurred in Canada at the Grand Prix de Troix-Rivières (GP3R) track, where Olivier wiped out at about 89 mph after clipping another rider’s handlebars, walking away with mondo road rash. Supermoto riders use a mishmash of road-racing and motocross gear, which is left up to riders’ preferences. Some go with full leathers, which allow them to slide across at high-speeds and walkaway un-scratched. Others opt for the tougher armor for dirt riding, which protects more against impacts but does little to protect against big slides on asphalt. Pete was in leather roadracing pants and motocross armor up top at GP3R. Guess where he got the road rash? In retrospect, Olivier thinks he could have done better last year had he been more careful when racing. By the fifth race, he was being more calculated in the way he approached new tracks, but became frustrated when he felt he should have launched over one jump on the course and carried more speed. The final race in Arizona had a new physical challenge, though: heat. Olivier said he felt out of shape because he never experiences temperatures that high while riding in New Hampshire. Not all of the hang-ups with Olivier’s run as a pro were on track, though. Olivier joined Wiggins in the tow vehicle for the return from California to New Hampshire, where the next Pro Supermoto race was, only to be pulled over and extensively searched in Kansas. Kansas now has drug checkpoints for cars coming out of Colorado, and officers seemed certain that the supermoto tow rig had to be running drugs. Cops gave them the nonsense excuse that their license plate frame on Wiggins’ Pennsylvania-plated truck—the kind dealers give out with cars—was illegal, and that was the reason they were pulled over. Clearly, they weren’t running drugs, and the plate frame was perfectly fine, but it was still a several-hour-long frustrating delay where officers unpacked absolutely everything they had. Still, going pro on a cheap bike was absolutely worth it. Olivier got to see parts of the country he’d never seen before, and experience fans who were completely stoked to see him out there. Seeing a packed stadium at the first race in California was an eye-opening experience. There, he was part of the autograph session alongside the other pros for the first time, and he couldn’t believe how big of a deal the revived Pro Supermoto series turned out to be. We were signing autographs, and we were taking kids and putting them on our bikes, taking pictures with them, and I couldn’t believe it. I couldn’t believe people came to watch us race and kids wanted my autograph. It was then that the dream of riding as a pro became real. Some of the places he went during the season were incredible. New Hampshire Motor Speedway was his local race, so there was a big cookout with a lot of Olivier’s friends. The series also competed in Sturgis, South Dakota during Bike Week, where he simply couldn’t wrap his mind around the sheer number of fans. Olivier said the high amount of bike traffic oiled down the already dusty roads they shut down for the course and made it extremely slippery, but it was still incredible. It was one of AMA’s televised races as well, and while Olivier wiped out after a big jump on TV, he still got to wipe out on TV. In Canada, the Pro Supermoto race utilized the same track as World Rallycross, where the likes of Ken Block and Sébastien Loeb competed on the same weekend. Sharing a track with some rallycross legends was completely surreal for Olivier, who is also a big four-wheel racing fan, too. The track is close-in to town, so the event turned into one big festival with Pro Supermoto, World Rallycross and Formula Drift in town at once. Making it the whole season on a Craigslist bike was a feat. He did a celebratory burnout after the final race as if he had won, despite the fact that his highest race finish all season was seventh place. When you show up and manage to beat bigger-budget bikes in vastly under-prepared and underpowered machinery, though, it’s a triumph. Olivier is taking a more measured approach this year, skipping a few races to build a new, more competitive bike that can keep up with all the others. If he’s competitive, he’ll consider coming back for a full season. Resisting the urge to break off and try other motorsports in the meantime, like drifting or crapcan races, is much of the struggle on Olivier’s limited budget. “Bikes are so much cheaper,” he noted. Olivier still can’t say exactly how much his season as a pro cost him, though. “I didn’t really tally it up, because I was afraid to know,” Olivier said of the costs. Probably a smart move. Either way, given that his entire bike build was less than the safety gear alone that’s required to add to an entry-level four-wheel crapcan racer, I’d say the budget was still shockingly reasonable.